Draft: 2009, Oakland Athletics, 7th rd. Has made 225 Major League apps, all in relief for the Nationals, Tigers, Braves and Angels...in 3 of the last 5 seasons was on a Major League Opening Day roster, with the Tigers in 2014 & 2015 and with the Braves in 2017...joined RHP Jim Johnson as the only Braves pitchers to appear in at least 50 games in each of the 2016 (63g) and 2017 (51g) seasons...in 2016 for the Braves posted a career-low 3.18 ERA in a career-high 63 games, the second-highest appearance total among all Major League lefthanded pitchers...made his Major League debut in a 10-1 Nationals loss on 6/5/13 vs the Mets (1ip, 1h, 0r, 0bb, 3k)...earned his first career victory in a 9-7 Nationals win on 7/25/13 vs the Pirates (0.2ip, 1h, 0r, 1bb, 2k)...earned his only Major League save in a 12-9 Tigers win on 6/14/14 vs the Twins (1.1ip, 1h, 2er, 1bb, 2k,1hr)..in 2010, in his first full season as a professional, was a mid- and post-season Midwest League All-Star. Attended Neuqua Valley High School in Naperville, IL, where in his career he went 9-1, 0.94 with 2 no-hitters, including a perfect game as junior in 2008...was committed to pitch at the University of Arizona before he was drafted and signed by the Athletics. Spent most of the season with the Class AAA affiliates of the Angels and Mets, combining to finish 3-0, 2.72 with 4 saves in 43 relief apps for Salt Lake and Las Vegas...also made 1 appearance for the Angels, in a 3-1 loss at Yankee Stadium on 5/27 (2ip, 1h, 0r, 1bb, 2k)...in February was signed by the Angels to a minor league contract with an invitation to Major League spring training camp...the day after he pitched for LAA at Yankee Stadium was designated for assignment and 3 days later was granted free agency...on 6/10 was signed by the Mets to a minor league contract...spent the rest of the minor league season at Las Vegas...was released by the Mets after the minor league season ended...on 1/29/19 was signed by the Reds to a minor league contract with an invitation to Major League spring training camp. Has been on a Major League Opening Day roster three of last four years (2014-15 with Detroit, 2017 with Atlanta) ... One of two relievers to appear in at least 50 games for Braves each of last two seasons (also, Jim Johnson) ... Missed 25 games on disabled list for Atlanta (Aug. 4-Sept. 1, 2017) with left oblique strain. 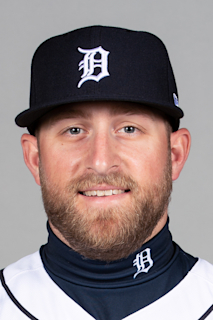 Made Detroit's Opening Day roster for the second consecutive season and appeared in 33 games out of the bullpen for the Tigers, going 2-3 (28.0IP/18ER) with a 5.79 ERA with 26 strikeouts in 28.0 innings pitched…Split the season between Detroit and Triple-A Toledo. Was a part of the Major League roster on four separate occasions. Optioned to Toledo on 4/23. Recalled from Toledo on 6/12. Optioned to Toledo on 6/24. Recalled from Toledo on 7/6. Optioned to Toledo on 8/10. Recalled from Toledo on 9/8 for the final time…Compiled a 1-1 record with a 2.30 ERA (8ER/31.1IP), 34 strikeouts and one save over 28 games with the Mud Hens…Earned the win on 9/16 at MIN, pitching a career-high 3.0 innings with one walk and two strikeouts. According to the Elias Sports Bureau, he became the first Tigers reliever to earn a win while hurling at least three hitless innings on the road since Dan Miceli held the Brewers without a hit in three innings of relief in a 12-inning Detroit win at MIL on 8/21/1997…Pitched in seven games during September/October and had a 1-0 record with a 2.70 ERA (6.2IP/2ER) and four strikeouts…Posted a 1-2 record with a 6.75 ERA (10ER/13.1IP) and 13 strikeouts in 14 relief appearances before the All-Star break and 1-1 with a 4.91 ERA (14.2IP/8ER) and 13 strikeouts in 19 games after the break…Lefthanded hitters posted a .326 (14-for-43) average, while righthanders batted .262 (17-for-65). Made the Tigers opening Day roster and appeared in 45 games out of the bullpen for Detroit in 2014...Fanned a season-high two batters on April 9 at Los Angeles -- equaled the high on April 12 at San Diego, May 9 versus Minnesota, June 6 at Boston, June 14 at Minnesota, August 11 at Pittsburgh and August 22 at Minnesota...Compiled a 3.38 ERA (8.0IP/3er) and six strikeouts in 11 games during April -- limited opponents to a .219 batting average during that stretch...Equaled a career high with 2.0 innings pitched on May 21 at Cleveland and August 11 at Pittsburgh...Posted a 1.59 ERA (11.1IP/2er) and seven strikeouts in 16 appearances out of the bullpen in May...Did not allow a run in 19 of 20 appearances out of the bullpen from May 2-June 9 -- compiled a 1.29 ERA (14.0IP/2er), six holds and 10 strikeouts during that stretch...recorded the first save of his major league career on June 14 versus Minnesota...sidelined June 21-July 6 with left shoulder inflammation...Assigned to single A West Michigan for an injury rehabilitation assignment on July 4 -- appeared in one game, tossing 1.0 inning of scoreless relief before being reinstated from the disabled list on July 6...optioned to Triple A Toledo by the Tigers on July 31 -- did not allow a run in four appearances (3.2IP) out of the bullpen for the Mud Hens before having his contract recalled by the Tigers on August 11...Appeared in three games out of the bullpen for the Tigers before having his contract optioned to Toledo on August 22...Limited lefthanded batters to a .261 (18x69) batting average...righties hit .348 (24x69) with him on the mound...Posted a 6.14 ERA (14.2IP/10er) and 15 strikeouts in 21 games at Comerica Park...Compiled a 4.00 ERA (18.0IP/8er) and 13 strikeouts in 24 games on the road...Compiled a 4.44 ERA (26.1IP/13er) and 10 holds in 38 games prior to the All-star break...Posted a 7.11 ERA (6.1IP/5er) and seven strikeouts in seven games following the break. Appeared in 32 games with the Nationals in two separate stints with the club during the 2013 season...Joined the Nationals organization on March 20 as the player to be named later to complete the January 20 trade that sent Michael Morse to Seattle...Assigned to Double A Harrisburg to begin the season...Did not allow an earned run in 10 consecutive appearances from May 6-31...Compiled a 0.00 ERA (12.0IP/0ER) and 14 strikeouts in nine games on the road...Posted a 0.69 ERA (26.0IP/2ER) and 29 strikeouts in 21 games with Harrisburg before having his contract purchased by the Nationals on June 4...Made his major league debut against the New York Mets on June 5 -- allowed one hit while striking out the side in 1.0 inning of work...Did not allow a run in his first 10.2 major league innings (nine appearances) from June 5-30...Tossed a season-high 2.0 innings, while striking out a career-high 4 batters on June 23 versus Colorado...also tossed 2.0 innings on August 17 at Atlanta...Recorded his first major league win on July 25 versus Pittsburgh...Assigned to Triple A Syracuse on August 20 and appeared in five games before being recalled by Washington on September 1...Appeared in five games with the Nationals in September, posting a 1-0 record and an 11.57 ERA (2.1IP/3ER) and two strikeouts. Assigned to Single A Stockton to begin the 2012 season before having his contract transferred to Double A Midland for the remainder of the season on August 8...Posted a 2.84 ERA (12.2IP/4ER) in six games out of the bullpen...compiled a 1-7 record and a 5.64 ERA (73.2IP/46ER) in 15 games as a starter with Single A Stockton...Appeared in eight games with Double A Midland out of the bullpen -- posted a 1-2 record and a 5.06 ERA (10.2IP/6ER) and 10 strikeouts...Ranked as the Oakland Athletics 31st-best prospect by Baseball America following the season. Appered in three games, as he was sidelined the majority of the 2011 season...Sidelined April 7-June 29 with a left elbow ulnar collateral ligament injury...Placed on the suspended list on July 10 -- reinstated on September 21. Named to the Midwestern League's mid and postseason All-Star teams as he completed his first full season of professional baseball in 2010...Assigned to Single A Kane County to begin the season...Compiled a 0.87 ERA (31.0IP/3ER) and 25 strikeouts in six games during May...Had his contract transferred to Single A Stockton on August 20 -- appeared in four games with the club, posting a 1-0 record and a 3.66 ERA (19.2IP/8ER) and 20 strikeouts...Rated as possessing the best curveball and and best control in the Oakland system by Baseball America following the 2010 season. Selected by the Oakland Athletics in the seventh round of the June 2009 draft, and appeared in four games between the AZL Athletics and Single A Vancouver...Compiled a 0-1 record and a 6.23 ERA (4.1IP/3ER) in four games between the AZL Athletics and Vancouver...Ranked as the Athletics 16th-best prospect following the 2009 season by Baseball America. April 2, 2019 LHP Ian Krol assigned to Louisville Bats. January 30, 2019 Cincinnati Reds signed free agent LHP Ian Krol to a minor league contract and invited him to spring training. September 2, 2018 Las Vegas 51s released LHP Ian Krol. June 11, 2018 LHP Ian Krol assigned to Las Vegas 51s. June 10, 2018 New York Mets signed free agent LHP Ian Krol to a minor league contract. June 1, 2018 LHP Ian Krol elected free agency. May 28, 2018 Los Angeles Angels designated LHP Ian Krol for assignment. May 19, 2018 Los Angeles Angels selected the contract of LHP Ian Krol from Salt Lake Bees. February 6, 2018 LHP Ian Krol assigned to Salt Lake Bees. January 31, 2018 Los Angeles Angels signed free agent LHP Ian Krol to a minor league contract and invited him to spring training. October 20, 2017 LHP Ian Krol elected free agency. October 19, 2017 Atlanta Braves sent LHP Ian Krol outright to Gwinnett Braves. September 1, 2017 Atlanta Braves activated LHP Ian Krol. August 30, 2017 Atlanta Braves sent LHP Ian Krol on a rehab assignment to Gwinnett Braves. August 30, 2017 sent LHP Ian Krol on a rehab assignment to Gwinnett Braves. August 27, 2017 Atlanta Braves sent LHP Ian Krol on a rehab assignment to Florida Fire Frogs. August 22, 2017 Atlanta Braves sent LHP Ian Krol on a rehab assignment to GCL Braves. August 4, 2017 Atlanta Braves placed LHP Ian Krol on the 10-day disabled list. Strained left oblique. May 10, 2016 Atlanta Braves recalled LHP Ian Krol from Gwinnett Braves. March 26, 2016 Atlanta Braves optioned LHP Ian Krol to Gwinnett Braves. November 20, 2015 Atlanta Braves traded CF Cameron Maybin to Detroit Tigers for LHP Ian Krol and LHP Gabe Speier. September 8, 2015 Detroit Tigers recalled LHP Ian Krol from Toledo Mud Hens. August 10, 2015 Detroit Tigers optioned LHP Ian Krol to Toledo Mud Hens. July 6, 2015 Detroit Tigers recalled Ian Krol from Toledo Mud Hens. June 24, 2015 Detroit Tigers optioned LHP Ian Krol to Toledo Mud Hens. June 12, 2015 Detroit Tigers recalled Ian Krol from Toledo Mud Hens. April 23, 2015 Detroit Tigers optioned LHP Ian Krol to Toledo Mud Hens. October 13, 2014 Ian Krol roster status changed by Detroit Tigers. September 29, 2014 Detroit Tigers recalled Ian Krol from Toledo Mud Hens. August 23, 2014 Detroit Tigers optioned LHP Ian Krol to Toledo Mud Hens. August 11, 2014 Detroit Tigers recalled Ian Krol from Toledo Mud Hens. July 31, 2014 Detroit Tigers optioned LHP Ian Krol to Toledo Mud Hens. July 6, 2014 Ian Krol roster status changed by Detroit Tigers. July 4, 2014 Detroit Tigers sent LHP Ian Krol on a rehab assignment to West Michigan Whitecaps. December 2, 2013 LHP Ian Krol assigned to Detroit Tigers. September 1, 2013 Washington Nationals recalled Ian Krol from Syracuse Chiefs. August 21, 2013 Washington Nationals optioned Ian Krol to Syracuse Chiefs. June 4, 2013 Washington Nationals selected the contract of Ian Krol from Harrisburg Senators. March 26, 2013 Ian Krol assigned to Harrisburg Senators. March 20, 2013 Oakland Athletics traded LHP Ian Krol to Washington Nationals. March 20, 2013 LHP Ian Krol roster status changed by Midland RockHounds. August 8, 2012 LHP Ian Krol assigned to Midland RockHounds from Stockton Ports. April 2, 2012 Ian Krol assigned to Stockton Ports from AZL Athletics. March 9, 2012 LHP Ian Krol assigned to Oakland Athletics. September 21, 2011 Ian Krol roster status changed by AZL Athletics. July 10, 2011 LHP Ian Krol suspended. June 29, 2011 LHP Ian Krol assigned to AZL Athletics from Stockton Ports. June 29, 2011 Ian Krol assigned to AZL Athletics. August 20, 2010 Ian Krol assigned to Stockton Ports from Kane County Cougars. April 5, 2010 Ian Krol assigned to Kane County Cougars from Vancouver Canadians. August 30, 2009 Ian Krol assigned to Vancouver Canadians from AZL Athletics. August 27, 2009 Ian Krol assigned to AZL Athletics. August 17, 2009 Oakland Athletics signed LHP Ian Krol.